Benefits of Taking a Bath | Valet. Hear me out, guys: Because I'm about to tell you that you need to clean your tub (which, I know, is a drag). But by the end of this, I'm confident that I'll have convinced you that this is a good idea and you'll be ready for a soak. You see, I'm a big believer in baths and have been for a few years now. But let's get real, I can't take a bath in the morning before work, when I need to wake myself up and get ready for the day. Nor am I going to take a bath when I get home from an evening workout, when I just want to wash away the sweat and grime. Showers are more practical. They're quick, easy and effective. But on the weekend? I've got the time to indulge. To take a load off, relax and treat myself (and maybe someone special as well). Does it take a little preparation? Sure. You want to make sure your tub is clean (and free of any soap scum and errant hairs). But after a long, restorative or romantic soak, I'm never sorry I invested the time. There are many reasons why it's worth it, and here are just a few. If you've had a long week of early mornings or late nights, a few rough workouts or simply haven't found a way to stop slouching when you stare at your computer screen, an Epsom salt soak is just what the doctor ordered. The minerals in the salts actually reduce inflammation, which helps sore muscles and joints recover from exercise or injuries. 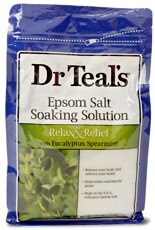 And my favorite blend goes one further by adding essential oils (eucalyptus and mint), which make it even more soothing. In the solitude of your bathroom, enveloped by warm water, you can't help but relax and let your mind wander. I find there's something about the steam surrounding me that makes me take deeper, more meditative breaths. Add to that the benefits of aromatherapy, and the stress just melts away. Simply drizzle in your favorite body wash, a few drops of the essential oil of your choice or even a proper bubble bath. Hey, you do you. No judgements when it comes to bath time. A bath feels good, sure. But it turns out, they do more than just soothe tension. A recent study, published in the scientific journal Temperature, found that an hour-long soak in hot water produced similar anti-inflammatory and blood sugar responses as 60 minutes of moderate physical activity. "It seems that activities that increase heat shock proteins may help to improve blood sugar control and offer an alternative to exercise," lead study author Steve Faulkner from Loughborough University wrote. Other studies have shown that a nice long soak can help men naturally lower their blood pressure. A hot shower can strip your skin of its natural oils, leaving your body feeling itchy and looking dry and dull. But soaking in a warm bath can be great for your skin, if you do it right. 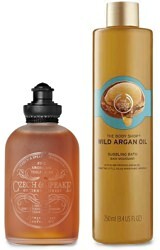 First, add a nourishing bath oil, which will absorb into the skin and hydrate your entire body. Secondly, use a wash cloth, loofah or body scrub to slough away dead skin and rough patches. When you dry off, your skin will feel and look brand new. Take it from someone who's spent a lot of time in the tub, you'll want to keep a glass of water handy. All the heat can dehydrate you. Even when I'm relaxing with a glass of wine or whiskey (which, I'd definitely recommend), I keep a glass of water nearby too.